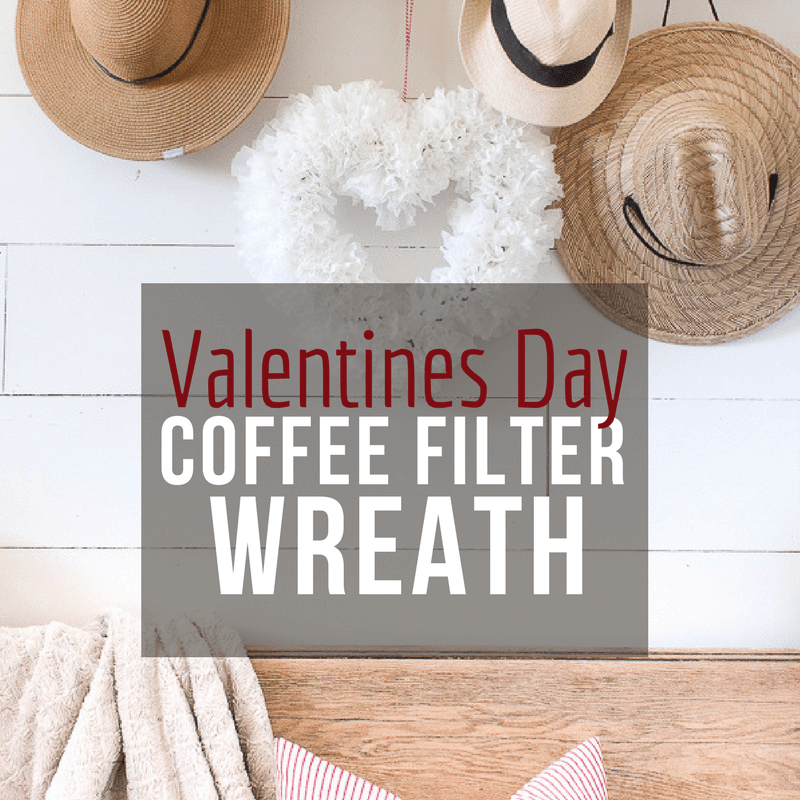 Make this super easy coffee filter wreath for Valentines day, even if you hate to decorate! 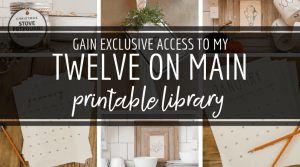 This is an easy way to add a bit of festive decor to your home. I am not one that loves to decorate for Valentines Day. I think its just the time of year you know? After spending months decorating and celebrating for Thanksgiving and Christmas, I am just plain burnt out. And poor old Valentines gets the shaft. However, my kids tend to think otherwise. They start wondering where all the Valentines Day decor ended up. And I can’t help myself. I have to add a few simple Valentines Day decor pieces. 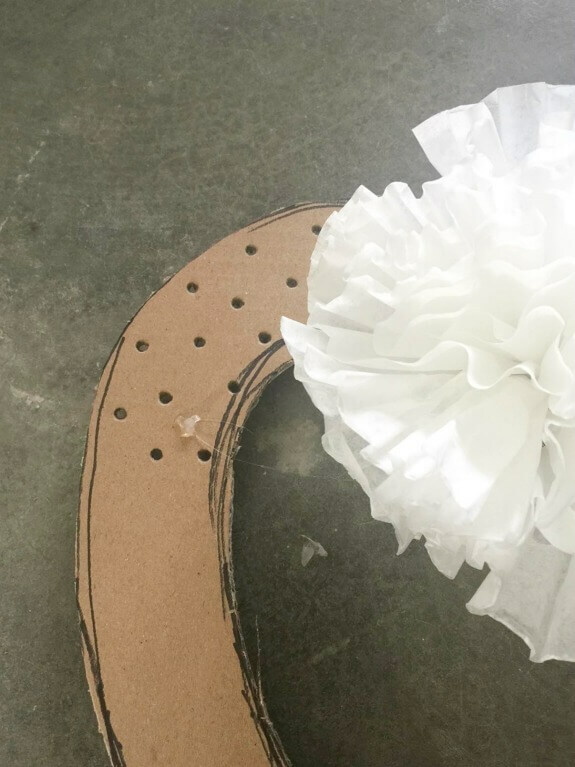 This coffee filter wreath is the perfect addition to my Valentines Day decor. 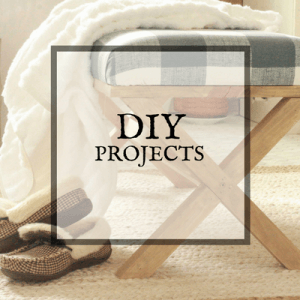 It was inexpensive, and quick to make. Those are all the things I like since I also tend to not want to spend money on Valentines Day. So, since this a a heart shaped coffee filter Valentines Day wreath, I used cardboard to create the base to the wreath. You can use any piece you want. I believe I found mine on the end of a box. Just the right size…and cost me nothing. 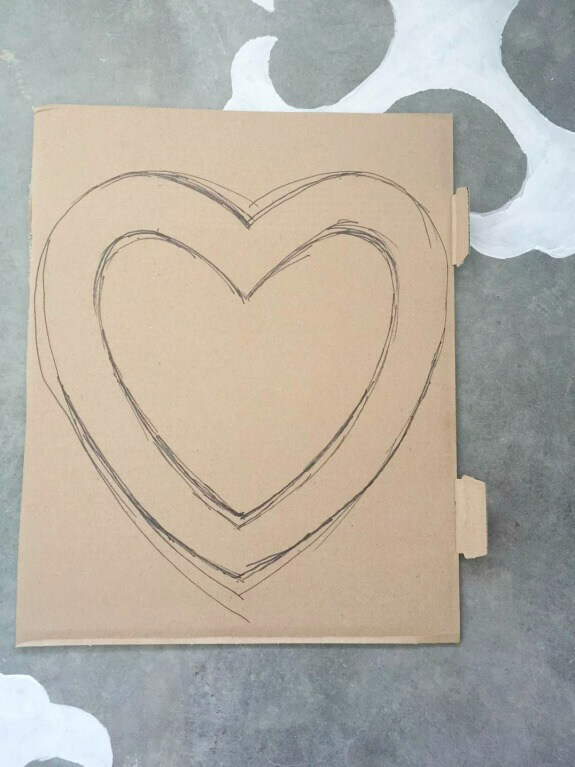 I simply freehanded the heart shape I wanted, but if you are weary about this, you can easily print off a heart and trace that. I used my trusty Xacto knife to cut out the shape. This is the best thing to use. 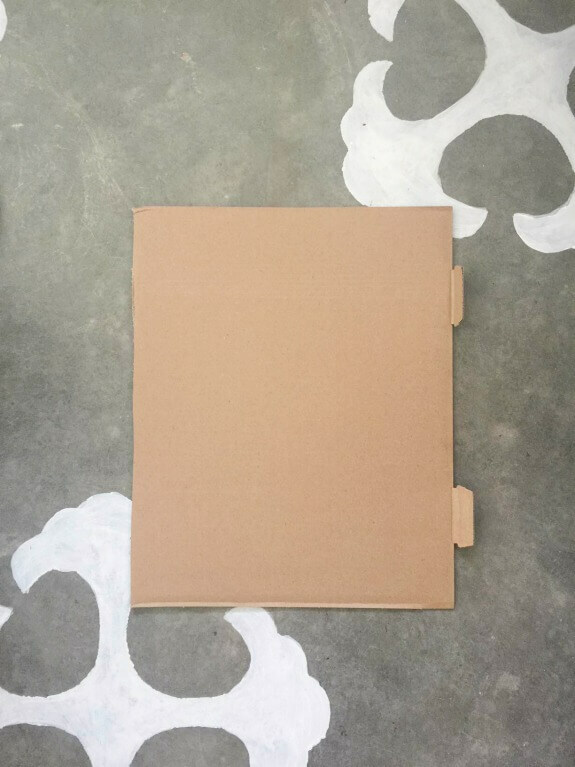 Scissors tend to bend and weaken the cardboard. The Xacto knife allows it to keep its strength and shape. I spread apart my coffee filters. These are just store bought coffee filters. Nothing special about them. I took a pen and poked holes through my cardboard wreath form. These holes will be the perfect place for those coffee filters to rest. I tried to space mine out about an inch. 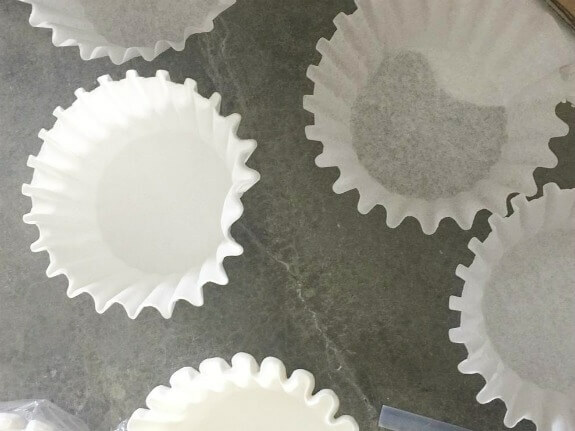 Take the coffee filter and gather the center of it. Then twist and pinch it until it is at a point. Next you will insert these into the holes you have created. 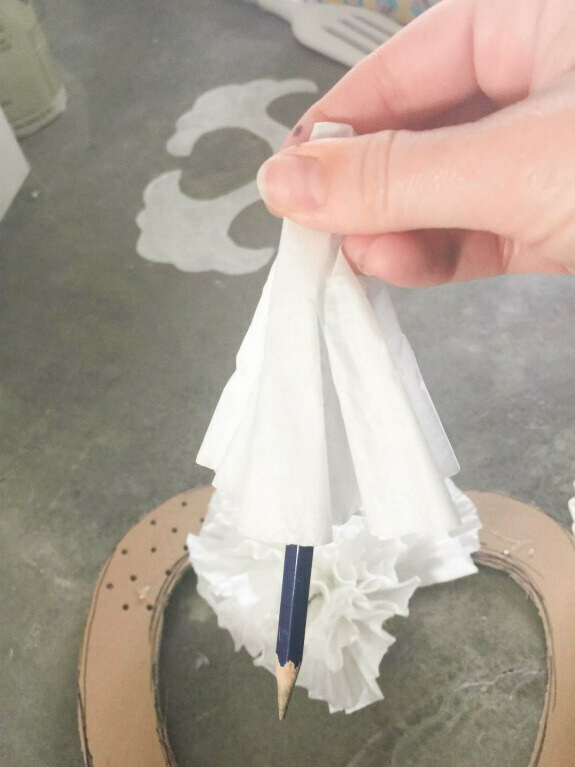 Now, if you find that your filters are not dense enough, or you want more bulk to your wreath, you can add more coffee filters to the wreath using this old fashioned method….. I wrapped the coffee filter around the end of a pencil and then glued it into the empty spaces. You can use hot glue or goo old fashioned Elmer’s glue. Either one will work. 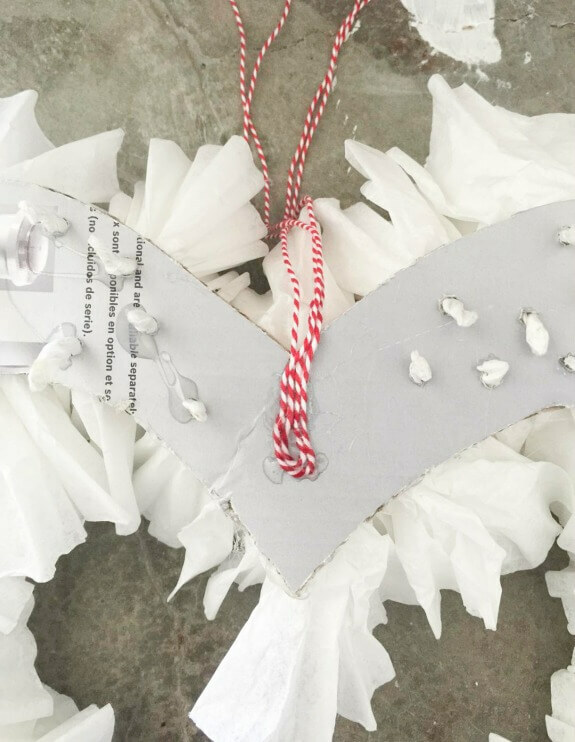 Continue all the way around the wreath inserting the coffee filters wherever you think it may need more. I made mine quite thick, because I wanted it to be full. I hot glued some red and white twine, as my nod to Valentines Day decor. Its such a cute way to hang it. Now, at this point you can customize your wreath however you want. 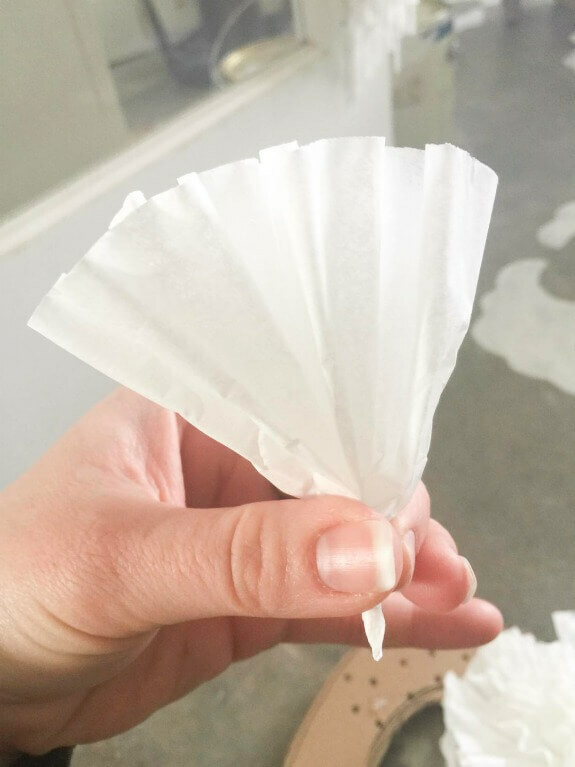 If you are not a fan of white, you can easily dry brush some paint on the edges of the coffee filters. You can also add a bit of water to it, so that the paint will bleed into the rest of the filter creating a gradual ombre effect. I loved the white, so I kept mine as is. It looks perfect with my farmhouse decor. The main area in my home that I decorate for Valentines Day is my entry way. That way anyone that may come and go from my house, will be greeted with something sweet and loving. This means that I can sneakily get away with not decorating anything else. I call that a win! 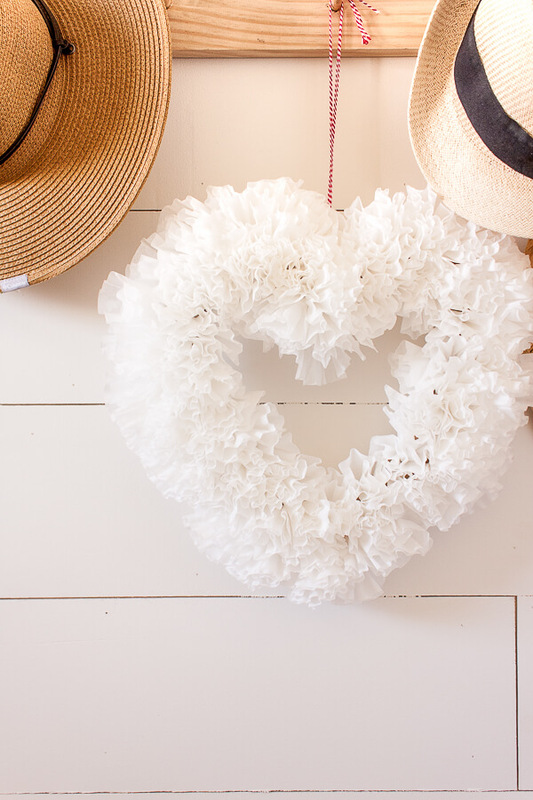 I added this coffee filter valentines day wreath to my super easy DIY peg coat rack. 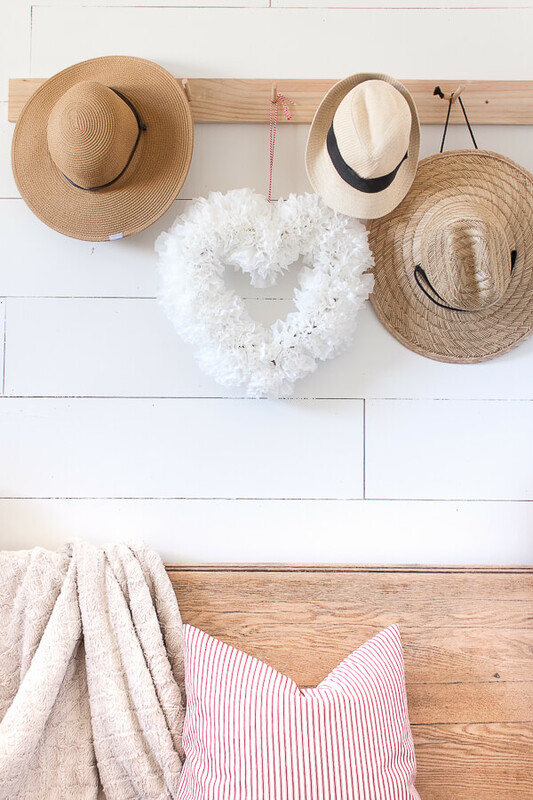 Doesn’t this coffee filter Valentines Day wreath look adorable with my straw hats and red and white striped pillows? I used these for Christmas as well, so they are getting double duty. I love it when you can recycle decorations throughout the year. 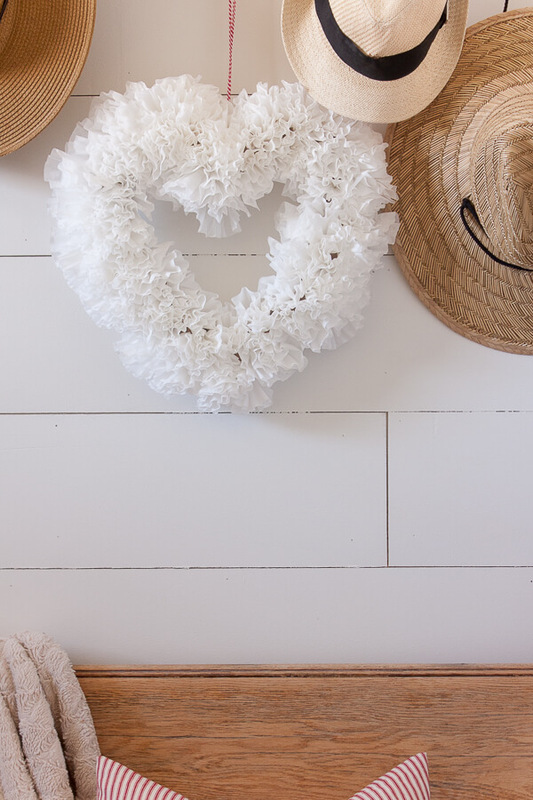 And I think it looks striking against the shiplap wall in my entryway. 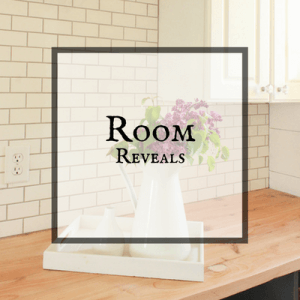 There are so many easy and inexpensive ways to decorate for Valentines. 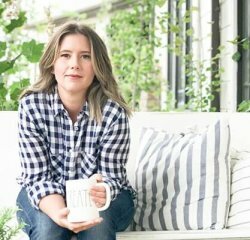 Your Valentines Day decor does not need to cost a lot of money or take a lot of time. 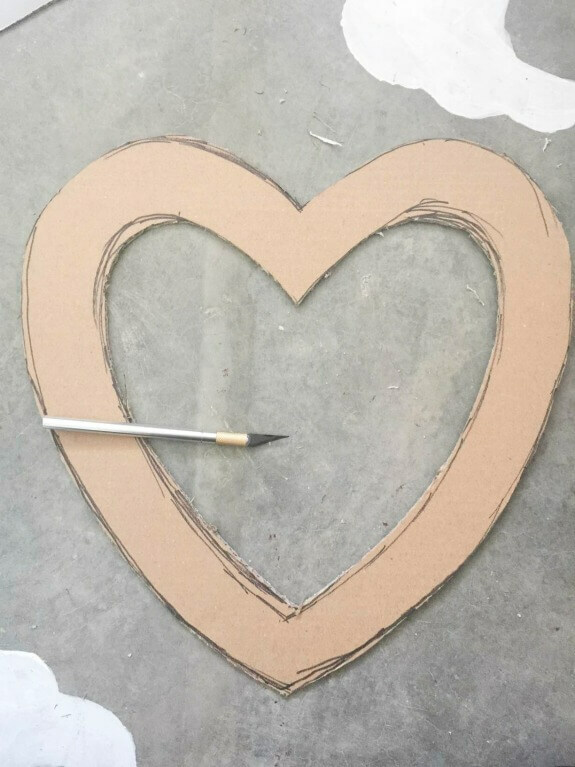 All the Valentines Day decor I use, I have created either upcycling old unwanted items, or using cheap and inexpensive ways to create something for my home. Now, I would absolutely love it if you shared this with your friends. 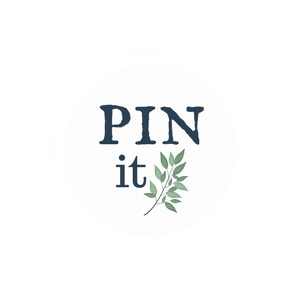 Why not PIN IT for later? this is lovely I think it could certainly be something I would keep up all year long. pinned. Hugs! Wow, This looks amazing. I think it will be the best gift for this valentines day. I will keep it in my mind and make it for sure. Thanks for the sharing such a creative idea. Oh how pretty and simple to make!